Under the Gateway and away!!!! Brisbane slowly recedes behind you. Ok, you have convinced me to setup a blog so I can chat to you on the high seas. 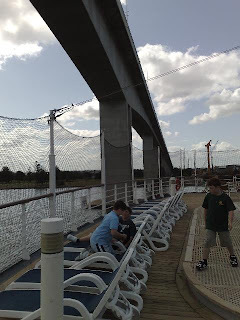 What surprises from the pics is the empty decks, particularly at sailaway under the bridge. Is your ssailing pretty full, or a few spare seats? We were in a “Kids only” area, on Deck 7 behind the kids club. Most of the people on board didn’t know about it, and you sort of felt guilty going down there unless you had kids with you. The cruise was pretty full – over 1250 passengers.